Exquisite corpse, also known as exquisite cadaver (from the original French term cadavre exquis) or rotating corpse, is a method by which a collection of words or images is collectively assembled. Each collaborator adds to a composition in sequence, either by following a rule (e.g. "The adjective noun adverb verb the adjective noun") or by being allowed to see the end of what the previous person contributed. The technique was invented by Surrealists and is similar to an old parlour game called Consequences in which players write in turn on a sheet of paper, fold it to conceal part of the writing, and then pass it to the next player for a further contribution. 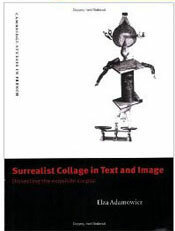 Surrealism principal founder Andr� Breton reported that it started in fun, but became playful and eventually enriching. Breton said the diversion started about 1925, but Pierre Reverdy wrote that it started much earlier, at least before 1918. In a variant now known as picture consequences, instead of sentences, portions of a person were drawn. Later the game was adapted to drawing and collage, producing a result similar to children's books in which the pages were cut into thirds, the top third pages showing the head of a person or animal, the middle third the torso, and the bottom third the legs, with children having the ability to "mix and match" by turning pages. The game has also been played with the usual orientation of foldings and four or fewer people, and there have been examples with the game played with only two people and the paper being folded widthwise and breadthwise, resulting in quarters. It has been played by mailing a drawing or collage in progressive stages of completion�to the players, and this variation is known as "Exquisite Corpse by airmail", apparently regardless of whether the game fares by airmail or not. The name is derived from a phrase that resulted when Surrealists first played the game, "Le cadavre exquis boira le vin nouveau." 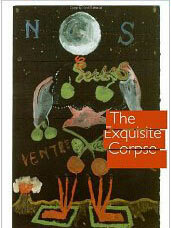 ("The exquisite corpse shall drink the new wine.") Andr� Breton writes that the game developed at the residence of friends in an old house at 54 rue du Chateau (no longer existing). In the beginning were Yves Tanguy, Marcel Duchamp, Jacques Pr�vert, Benjamin P�ret, Pierre Reverdy, and Andr� Breton. Other participants probably included Max Morise, Joan Mir�, Man Ray, Simone Collinet, Tristan Tzara, Georges Hugnet, Ren� Char, Paul �luard, and Nusch �luard. Henry Miller often partook of the game to pass time in French caf�s during the 1930s.